Here we go again. Five more Facebook tips for you and yours on this Friday. So social media is NOT about ME (=you/your brand) or being the media (all the time), the focus is on being social. Having a conversation with someone (online or offline) creates a relationship. And since “people do business with people they know, like, and trust”, building a relationship with your past/current/future consumers is key. Otherwise each sale is just “buy”, or “goodbye”. Selling a product once to one consumer is nice, but wouldn’t it be much better if that consumer stays with you for a long(er) time? Seeing big (and small) brands turning the “Post By Others” wall off is something I can not comprehend. Ignoring your past/present/future customer, in public, isn’t good marketing in my eyes. So open up the “Post By Others” wall and then open it up all the way (see screen shot below). You want your fans to be able to tag their friends in your photos, so your content gets spread whenever possible. Having your current fans telling their friends about you is super valuable. We all trust our friends more then anything, and social media is word of mouth on steroids. Why would you try to stop that? As a Facebook Page you can “like” other Facebook Pages, which displays in the right colum on the top of your Page. This is basicly a list of other Pages that you think your fans should “like” as well. So you would add brands, retailers, and athletes on this list that you want to align yourself with. So don’t try to make this list endless. Less is more. I think anywhere from 5 to 50 could be a decent size list. To add another Facebook Page to your list just go to the Facebook Page you want to add, and click on the “wheel” below the cover photo (on the right) and click “Like As Your Page”. 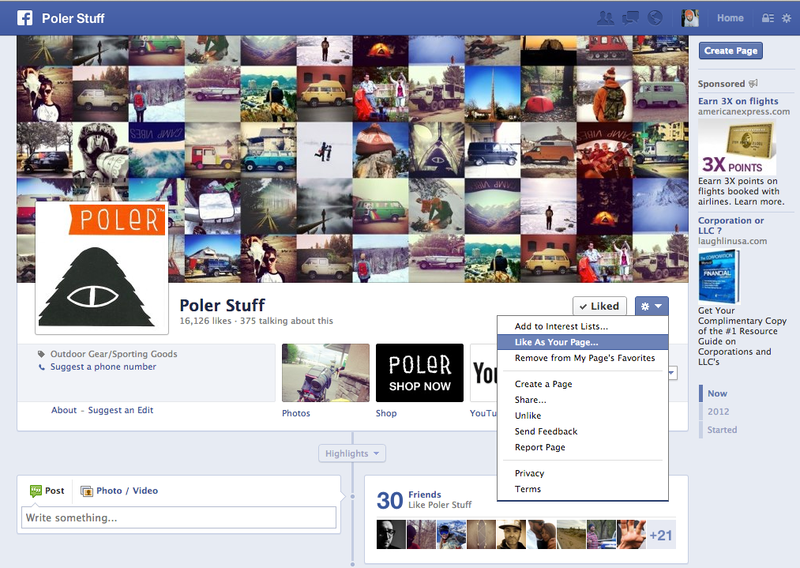 If you handle multiple Facebook Pages you get the option to pick the Page you want to add it to. So now that you have a list of Pages added to your “Recommend Likes”, the “Likes” box will display up to 5 Pages that your Page likes. This list will change with every refresh, so each one on the list gets displayed at random. If you “like” more then 5 Pages you don’t control which Pages get shown. But you can set certain “Featured Likes”, so those will show up every time. I don’t recommend locking in all of the 5 spots, as then the others Pages will never show up. So maybe lock in the first 2-3 spots makes the most sense. To set the Featured Likes go to “Edit Page” and “Edit Settings”. On the left click on “Featured” and then click on the box “Add Featured Likes”. Now the list pops up of all the Pages that you like with your page. Select the ones you want to lock in. For a while now there a 5 different degrees of admin roles. Only the “Manager” can add and delete others. 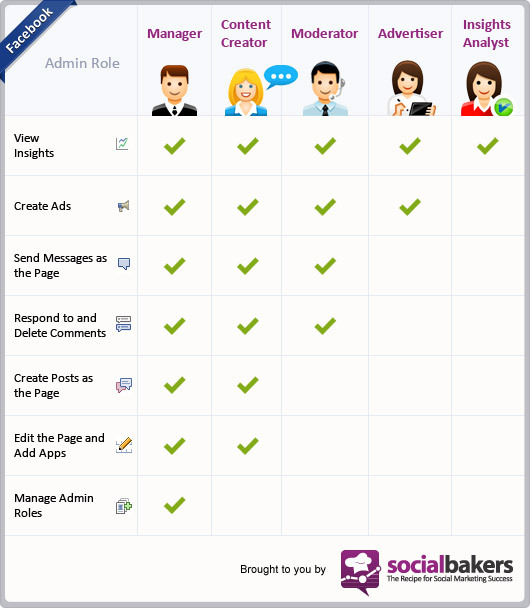 Best is to have 2 people be an manager, in case something happens to one of the profiles from the admin. (Hacked, banned, etc) If someone has a fake (personal) profile you want to be extra carefull, as Facebook can at any time delete that profile. And if that’s the only admin of the Facebook Page you’re screwed. As far as adding any others admin, once again, less is more. If you add more people to your Facebook Page, to post (in specific territories) make sure they now how to post, respond, and tag right. *Please note that any manager can hijack the page and kick everyone else out. It all comes down to trust, and maybe adding something in the contract of your social media employees. I see a lot of people just post stuff, and not interact. They turn their “Post By Others” wall off and just do one-way traffic. Being anti-social on social media, wtf! When some people constantly question the ROI of social media, it blows my mind that most of them don’t interact. So when you post something, check back after a few minutes, a few hours, and the next day(s). See if people have questions about the product or anything else. And delete spam comments and approve the comments that were flagged as spam (incorrectly). More then 60% of the time people check Facebook from a mobile device and most people having notifications turned on, they can and will respond quickly. Keep the momentum going and talk back to them, and more importantly, have a conversation with them. In the first 30-60 minutes you can really help increase the reach of your post by doing this. And you might be able to sell some extra product while being at it. Are you ready for 1-on-1 marketing yet? Hope this is once again helpfull. This entry was posted in Brands, Marketing and PR, Social Media and tagged admin, facebook, Featured, interaction, likes, mobile, pages, post by others, roles, wall by Fred van Schie. Bookmark the permalink.